Eimear Kearins is currently a sixth-year student in the Ursuline College in Sligo. 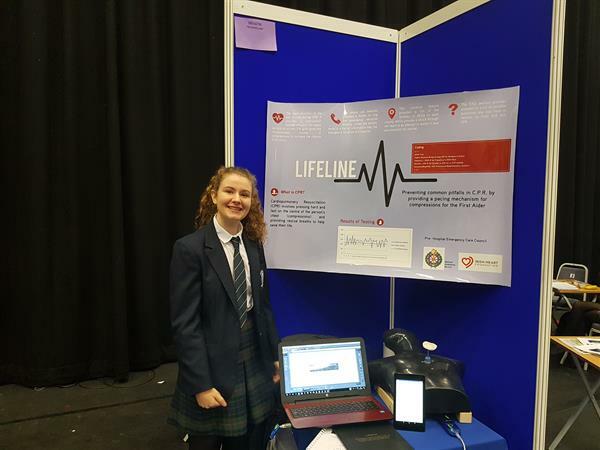 Last May Eimear entered a technology project, ‘LIFELINE - Saving lives one beep at a time’, into SciFest@IT Sligo and won the Boston Scientific Medical Devices Award. Eimear now hopes to compete at the SciFest 2018 National Final which is to be held on 9 November in the Marino Conference Centre in Drumcondra in Dublin. Below, Eimear talks about what she has achieved since winning the Boston Scientific Medical Devices Award at SciFest@IT Sligo. ‘Receiving the Boston Scientific Medical Devices Award in the regional finals in Sligo IT, gave me a surge of newfound enthusiasm and drive to push my app to reach its full potential. Since May, I am delighted to say, Lifeline has undergone mammoth development. First, I got in contact with all website and app development companies in Sligo and the surrounding counties (needless to say, they weren’t abundant!) asking if they would like to develop my app, pro bono. However, all I got were replies giving me quotes and how much it would cost. Being only a secondary school student with the intention of not making profit from this app, this wasn’t an option. A web design company in Sligo however regretted to tell me they would love to help but they just develop websites. But, they put me in contact with an app development lecturer in IT Sligo that they thought could help. This lecturer, one of his students and I have been working together since to develop my app to achieve its full potential. At the Regional final, I presented a prototype version of my app to the judges that had been coded completely by myself. My application is now a lot more aesthetically pleasing and looks less like a science fair project and more like a professional serious app. All the functionalities now work in conjunction with one another and the app is no longer prone to crashing. Some of the functions, like the AED locator, underwent improvements that would not have been possible to carry out on my own. For example, the application can now detect the location of the user and give directions to the closest defibrillator, rather than pinpointing all the defibrillators in the country, which it previously did. The help I received has allowed my app to take the next step up and reach its full potential.